ENGEL AUSTRIA CANTONI and set new standards in terms of process integration. The jointly developed inject2blow method combines injection molding and blow molding process in a common mold in an injection, thus reducing significantly the cost and time involved in the production of cosmetics, pharmaceutical and food containers. 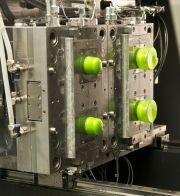 With a cycle time of under 14 seconds for the production of wide mouth jars on an ENGEL victory injection molding machine with 90 tons of clamping force in a 2 +2- cavity mold from CANTONI, Abbadia Lariana / Italy, the production efficiency of inject2blow can not be beat by conventional methods. While usually first made by injection molding preforms, and these are in a second, subsequent process further processed in a blow molding machine to the final product, the new method provides turnkey small container in a single operation. Until now, such an integrated method on the market are not available. Other advantages of the integration process are smaller fixed investment costs, a smaller system footprint, higher system availability, easier quality control and no restrictions due to clamping force limits. In inject2blow method can be processed a wide range of thermoplastics, polyethylene and polypropylene, polycarbonate over to PET. and ENGEL CANTONI provide integrated manufacturing systems from a single source. These include, apart from the ENGEL injection molding machine, a sliding table CANTONI tool and an ENGEL viper linear robot for de-molding of the finished parts. Both the injection and blow molding process of the CC are visualized 200-Control of ENGEL injection molding machine, controlled and regulated. That is, the machine operator in injection molding must not be incorporated into a new technology, but is from the trusted him ENGEL control intuitively through the combined injection molding and blow molding. In the production cells matched to the application of the series injection molding machines come ENGEL victory and ENGEL e-victory is used, because of their bar-less clamping unit offers plenty of space for the sliding table tool. As the platens of tiebarless machines to the edge and sometimes even can be used in addition, large tools fit on relatively small injection molding machines. Thus the size of the machine is determined by the required closing force and no longer according to the size and range of movement of the tool, which holds the investment and operating costs low. Also simplifies the accessibility to the tool room automation, since the robot can freely access directly from the page. , the integrated process is characterized by a high degree of energy efficiency. Responsible for this are mainly two aspects. First, the preforms have versus the traditional, two-step manufacturing process before the blow not be heated again. Second, reach the ENGEL victory machines and e-victory by ecodrive, the energy saving option for hydraulic ENGEL injection, fuel economy, can be measured with those of all-electric machines. With the servohydraulic ecodrive equipped hydraulic injection molding require – depending on machine type and application – between 30 and 70 percent less energy than comparable machines without energy-saving option. Despite the high degree of process integration and automation, the production cells prove to be very flexible in operation. Kavitäteninserts simplify the product change and make the production of small batches economically. Since the inject2blow process is based on standard injection molding machines, the system can be utilize with tools for traditional injection-molded products.